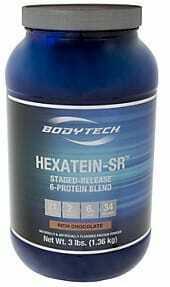 Hexatein is a new addition to Vitamin Shoppe’s Bodytech supplement line, boasting a time-released protein matrix. Within Hexatein, there are 6 different types of protein totaling 21 grams per serving. This creates a fast, medium, and slow digesting time-frame allowing for constant protein influx from the stomach. Here we are going to give you our review on Bodytech Hexatein as well as our take on what’s inside this protein supplement. Directly from Vitamin Shoppe, we got hooked up with a 34 serving 2.92 lbs. container of cookies & cream flavored Hexatein-SR. The powder was light, fluffy, and mixed extremely well with water in both shaker cups and standard cup and spoon. Compared to other multi-sourced protein supplements, this is a plus as they can be rather hard to mix. Taste wise, cookies & cream Hexatein-SR was on point. It’s creamy, light, and very satisfying; without any strange aftertastes or textures. Definitely a good call for post workout as well as daily protein boosting. While you can take it at any time, Hexatein-SR is most effectively utilized: before bed, after training, and before a long period of fasting. This is due to Hexatein-SR’s extended digestion, allowing for long and constant protein assimilation. As well, we recommend upping the dosage to two scoops if you are a larger guy, or substituting Hexatein-SR for food. As you know, Hexatein-SR contains 21 grams of protein. That protein, is a blend containing: whey protein isolate, whey protein concentrate, micellar casein, milk protein isolate, calcium caseinate, and egg white powder. Their exact ratios and amounts are not individually disclosed, unfortunately. Whey Protein Isolate is separated from milk, and is a rapidly digesting protein source. It is highly bioavailable and one of the most popular protein powder supplements. Whey protein concentrate is the concentrated form of whey protein derived from milk. This is the cheapest source of whey protein, as it is the direct byproduct of cheese and milk production. But rest assured, it is highly purified. Micellar casein is the highest quality form of casein protein. Casein, in general is a slow digesting protein derived from milk. Upon ingestion, casein forms a ‘ball’ in the stomach which slowly digests thus slowly releasing amino acids into the body. Milk protein isolate is essentially the proteins of milk with minerals and lactose removed. This form of protein is typically around 90% protein and is highly effective. Calcium caseinate is the more economical casein protein, and is much more widely available. It is essentially whey concentrate in comparison to isolate, to put simply. Egg white powder is the only protein source in this supplement that is not derived from milk. Considered to be a highly well-rounded amino acid source, egg whites boast extremely high bioavailability. This is a medium digesting protein in regards to time. In addition to the 21 grams of protein, Hexatein-SR also contains 10 grams of carbohydrates with 4 grams of fat. That’s pretty modest compared to standard whey protein concentrates available in most supplement stores. The carb sources, and sweetening is pretty natural and doesn’t break any rules in our book. In Hexatein-SR there are no artificial colors, sweeteners, yeast, fish, or preservatives. In the long run, this is a huge benefit as those little amounts in other products really build up over the years. Overall, Hexatein is a useful and realistic extended release protein supplement. It tastes good, has very little additives, and is modestly priced. If you’re on a budget, Hexatein-SR is the primary extended release protein option out there. The value is simply unbeatable. To find Hexatein, you will need to check out Vitamin Shoppe. This can either be done online or at one of their many store locations. It’s important to note, that Vitamin Shoppe staff don’t badger you like GNC employees. With that being said, you can look around and check out all sorts of supplements at Vitamin Shoppe without being pressured. We Hope you enjoy your protein and subsequent progress! This review is BWSB’s honest opinion of Hexatein-SR. This review was made possible thanks to Vitamin Shoppe for free, and we appreciate that. But, it has not biased our opinions; as either way we spend hundreds of dollars every month on supplements to review.